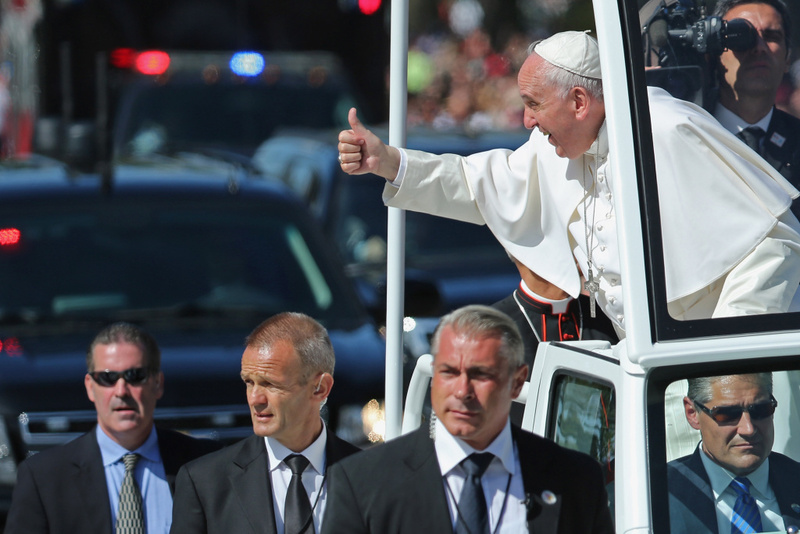 Papal politics: How Pope Francis stirs the culture wars in D.C.
Pope Francis leans out and waves to the crowd as he rides in a popemobile along a parade route around the National Mall on September 23, 2015 in Washington, DC. The most politicized pontiff in contemporary history is in Washington D.C. this week. This morning, he was welcomed by a crowd of thousands along a parade route to the White House. President Barack Obama introduced Pope Francis who addressed an audience of 15,000 on topics ranging from religious liberty to pollution and immigration - all hot, divisive matters in the current political climate. “As the son of an immigrant family, I’m happy to be a guest in this country which was largely built by such families,” said Francis. Tomorrow, Pope Francis will address the U.S. Congress. AirTalk will preview his remarks and how politicos are spinning Francis’ remarks.